For most of this year, I've been concentrating on working with colored pencils on watercolor paper using the Icarus board. There's not too much in prep work other than drawing the composition out and there's no splattering of paint with happy accidents. Instead, things are very thought out to the nth degree. This medium lends itself very well to doing photo-realism but if you try to think of getting outside that box, it numbs the brain on how to do a color-expressive composition that evokes a calm, yet mysterious mood. How does one convey a kind of magical nature painting? I find it easier to do with watermedia, but colored pencils is another very challenging story. I do love to work with colored pencils as it harkens back to happy childhood times of sitting down and just drawing while humming to myself. It's just nice to watch every trace of pencil mark go down on paper, much like watching something grow. My challenge was to create a painting that may possibly be entered in the "Now and Then" show for the San Diego Colored Pencil Society Members Show later this summer. In keeping with "nature" themes, I chose to do a sort of years-in-the-life of a Magnolia tree. I'm trying for my own style, which many find to be a very Asian or tropical style and that's fine with me. I often walk my dog on Magnolia Street here in Santee, under the Magnolia trees and I took a few photos of trees, flower blooms, and buds. I printed several photos out and cut and pasted some buds on a tree for my composition. I also took a magnolia seed and placed it on gravel in my garden. 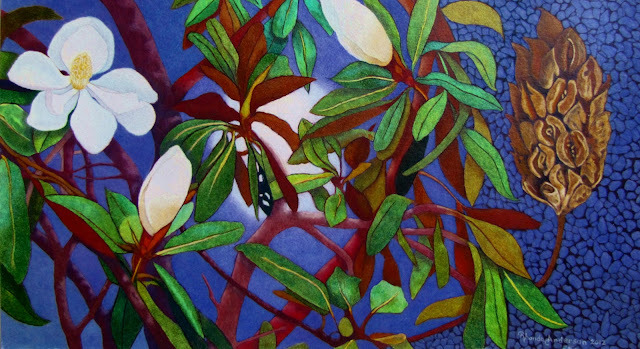 The challenge was to create one composition form both the flowering tree and the seed. I used the moon as a subtle focal point and unified the whole piece using the purple-blue of the night and gravel. I also wanted to invoke the mysterious devine nature of life starting with the seed which grows into a blooming tree that produces more seeds and, hence, more trees and so the cycle of life goes. I like to show the viewpoint from the tree itself and yes, I'll climb the tree to get that perspective! The other dilemma for colored pencils is although you are technically drawing, if you fill the entire paper with colored pencils whether it be wax or oil, is it a painting? I've heard the saying that painting is drawing with paint. Why can't colored pencils be a painting? Some have said that it's pompous to call a colored pencil piece a painting. I'm not trying to be pompous, but after spending so many hours (with use of an Icarus board) layering in the colors, why can't I call it a painting/drawing. What is the difference between both. I could easily do a watercolor in probably a few hours of the same subject but it would definitely have a different outcome but still be called a painting. So here's my finished piece called "Within, Without". The jury is still out on the title and I may change it. It's done on 140lb hotpress watercolor paper using Prismacolor colored pencils with an Icarus board with every inch covered and burnished in pencils.